This is what the great fishing look like for us last night! Great Fishing last night! The Kings were biting and Buzz and I had a ton of fun on TJ's boat fishing in the Steelheaders Tuesday night league! We left the pier heads at 6 and started pulling lines at 8:30. In that short amount of time we went 11 for 14 with 7 Kings, 3 Steelhead, and 1 Coho. We did miss the 2 biggest fish of the night though which would have definitely helped us at the weigh in. 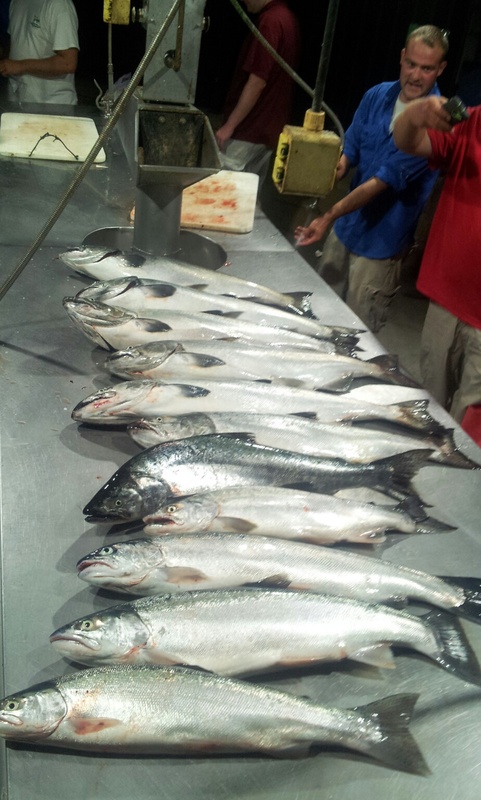 As it was, we took 3rd place for the night as several boats weighed in some nice big Kings. Everything came on meat or flies in 120 to 150 FOW and copper rods had most of the action. 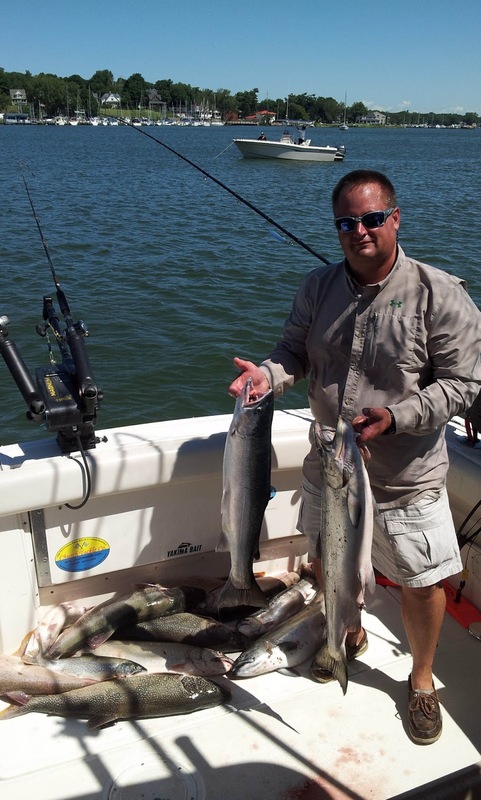 Straight out of Holland and fish were biting on any trolling direction and we were marking them consistently. I fished with TJ/Bending Limits in the Waypoint Classic on Saturday morning. We started out going for Kings, North of Saugy,95-105 FOW. After only going 1-4, we moved in a little shallower and put the trout baits on (Spin-n-glows) and started working the bottom. We took several, but not enough to weigh 12 fish as we needed. We ended 8 for 15 with 7 Lake Trout. 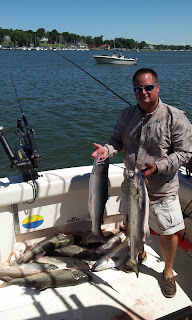 A lot of kings and steelhead were caught by several boats with the steel head out deeper in the 110 - 140 range. The Big Red Tournament was a lot of fun but once again the fishing, for the most part didn't go our way. Team Rhino (Mark, Marc, Wade, Paul, and Tony) was in right in the middle of the pack after day 1 when we caught 3 smaller steelhead and a 12 lb king. The action was on 4 different poles: 3 lead lines with spoons and one downrigger with a meat rig and we ended 4-6 with the action coming in 70-85 FOW. Day 2 was another story where the fishing was more difficult because of the wind and waves and the fish didn't seem to be biting. 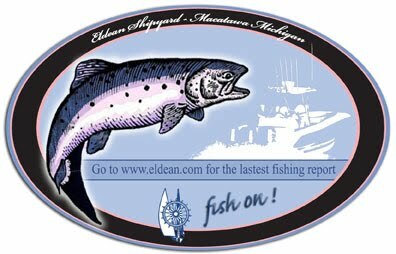 We only caught 1 steelhead and couldn't get much to happen including marking very many fish and spent our time in the 70 to 120 foot range until the tournament was cancelled an hour early because of big waves. On Friday I went out and practiced fished with Capt. TJ on Bending Limits. We had a difficult time targeting kings in the first couple hours so we went back to targeting Lake trout and before noon we had 10 Lakers, 2 Kings, and a Steelhead. Our biggest fish was a 15 lb king that we caught after snagging somebody's copper that had broken off. After reeling in the copper, TJ then hand-lined in the second copper to find a freshly broken off King. Bending Limits and a few other of the Pro boats finished in the top 10 in the Big Red and it was definitely due to their ability to target Lake Trout and fill up the cooler.